In an increasingly digitalized world, writing remains the most traditional, but also emotional and creative way to communicate and express yourself. This is even more true for kids and teenagers who still have to use paper and pens in their daily life. 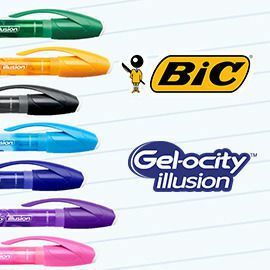 BIC has just launched a new product in its range of writing solutions: Gel-Ocity Illusion. Gel-ocity Illusion is an erasable pen using thermo-sensitive ink that writes, erases and re-writes neatly, while delivering great writing performance. Erasibility gives room for creativity, kindness, fun, etc. and BIC wants to find an original, fun and unique way of communicating it. We need your creativity to inspire the TV campaign for the next back-to-school period: create a story that demonstrates the Gel-Ocity Illusion erasability feature in a fun and appealing way for kids and teenagers! Participate before May 13th, 23:59 UTC. Good Luck!